Wheelchair travel is rewarding, but not always easy. Whether you have a disability or not, traveling for Thanksgiving, Christmas, or Hanukkah means extra stress. November and December are the busiest travel months of the year, and like everyone else, people with disabilities are more likely to take trips during this time. I’m a travel addict, but for those who don’t travel often, preparing for a trip, packing, and planning for accessibility can feel overwhelming on top of the hustle and bustle of the holidays. I spent 20 years living thousands of miles from my closest family, so traveling for Christmas was an almost yearly event. I learned a lot during that time, so in the spirit of giving, here is my wheelchair travel guide to surviving the holidays. Planning ahead is essential for a safe and smooth trip. No matter what time of year, wheelchair travel requires extra time and planning. We simply have to think about things that others don’t. For holiday travel, there are additional considerations. Everything may and likely will take longer because of the sheer number of people traveling. Weather can also be a factor. Flights may be delayed, and roads may be slippery due to ice and snow. Allow extra time for everything compared to what you normally need to accomplish the same task or reach the same destination. Throwing a bunch of stuff in a suitcase the night before you leave is never a good idea for any traveler, but for disabled travelers, we risk forgetting essential items that we need for safety and mobility. I will be writing an in-depth wheelchair travel packing guide in the future, but for now, here are a few simple tips for packing a suitcase and making sure you bring what you need. – Pack essential safety items such as medications first, and put them in a secure place where you’ll always have access to them, such as in a bag on your wheelchair. 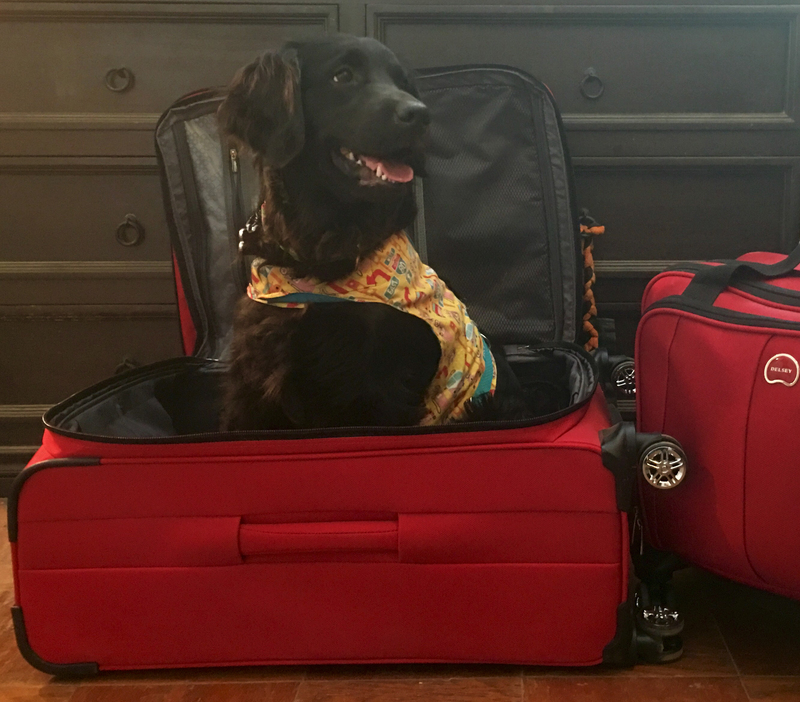 If you’re flying, they should be in your carry-on bag in case your luggage gets lost. Keep a change of clothing in your backpack or in a carry-on bag, in case you get stuck at the airport, at a truck stop during a snowstorm, etc. – Whenever possible, have travel versions of items that you absolutely don’t want to forget. For example, I have a small wheelchair travel battery charger. My normal charger is faster, but huge and would nearly take up its own suitcase. The travel charger is about the size of a laptop power converter, and stays in my suitcase all the time, so it’s always ready for my next trip. Bring extras of important things. The trick is to pack light, but not too light. If you’re traveling for a week or less, you really don’t want to have to deal with laundry. Bring extra clothes, especially extra pants, in case of bathroom issues, spilled food, etc. – Plan outfits in advance. Instead of packing a stack of shirts and a stack of pants or skirts, pair them with each other when you put them in your suitcase. It’s faster and easier to get going quickly in the mornings during your trip, as your clothing is already ready to go. If you know your itinerary, you can even decide what you are wearing on each day, for example, a nicer outfit for Thanksgiving dinner, or your favorite ugly sweater for a Christmas party. Packing folders and cubes are the very best way to keep your clothing organized. They reduce wrinkling, and make it easier to unpack when you get to your destination. They naturally compress your clothing so that it takes up less space. They are easy to use even if you have limited hand mobility, as they stretch and close with Velcro. I also highly recommend compression bags for packing socks and undergarments. Airlines can’t charge extra bag fees for transporting mobility equipment. If you need to bring a walker, shower chair, etc. with you, don’t hesitate. You want your trip to be as safe and comfortable as possible, and that means having the right equipment. There are awesome portable versions of many of these items, so even if you’re driving, they won’t take up as much space as you might think. Many people who travel for the holidays are going from a place with warmer weather to somewhere that has snow and ice. For 20 years, that was me, driving from sunny California to the freezing Midwest or snowy mountains. In California, I didn’t need a heavy coat, but I eventually bought one for my travels and was glad I did. Coats, like all clothing for people with disabilities, can be tricky to shop for, and we tend to have very diverse needs. What works for one person may be terrible for another. However, I’ll share what I like and why. For me, packable down coats are the best choice. They are made of slippery material, which makes them easy to put on. They are warm, but not too bulky, so they don’t inhibit my already limited movement as much as other coats. They squish down to an almost impossibly small size, so they easily fit in my backpack. My second favorite choice is Columbia brand jackets. They are a little bit more difficult to put on, as they are made of a soft material, but they are thin yet warm and extremely comfortable. I keep one in a compression sack in my backpack at all times, so I’m always prepared for changes in the weather. 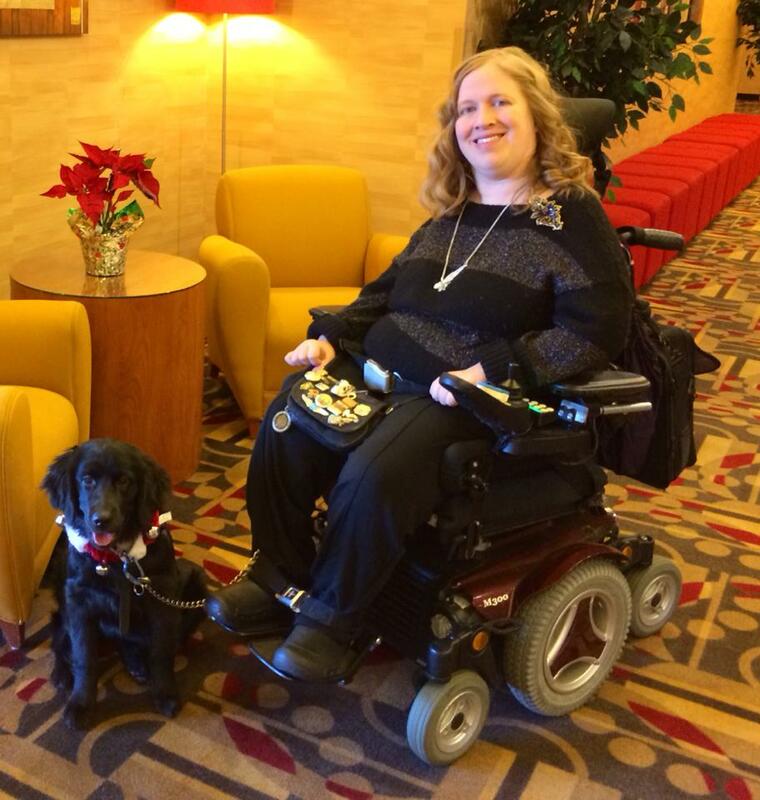 Holiday guests typically stay with family, but that isn’t always possible for those of us with physical disabilities. When deciding whether to stay with relatives, consider the physical accessibility of their home. Are there steps, and if so, how many? Is there a bathroom on an accessible floor that will meet your mobility needs? Is there a bedroom on the ground floor where you can sleep and have space for any medical equipment you may need? Families often want to be supportive and accommodating, but sometimes the physical realities of their home make staying with them difficult to impossible. Well-meaning relatives may not understand the extent of your needs and think that just because their home doesn’t have steps, you can stay there, or they may not realize that carrying your wheelchair isn’t an option. Don’t be afraid to politely turn down an offer of accommodation if the situation won’t work for you. Once you arrive, it may be possible to change things at the house to make the situation work in the future, or at least help your loved ones understand why you need to stay in a hotel. Even if a relative’s home is not accessible enough for you to stay there, you may need to get in for family meals and festivities. In these situations, having a portable ramp can make the difference between smooth, easy access and a difficult, possibly hazardous situation. Portable ramps are relatively inexpensive, and can be transported easily in most vehicles. They are great for providing access to buildings with 1 to 3 steps, though I have done up to 5. Obviously the more steps, the longer the ramp you need, but it isn’t necessary to meet ADA standards for a temporary situation. Even a fairly steep grade can be negotiated with assistance from family members pushing and/or guiding your wheelchair up and down the ramp. If you visit a particular relative on a regular basis, and they have storage space, it’s not unreasonable to ask them to keep the ramp at their home for future visits. I own two portable ramps and always keep them in the back of my van. With these ramps, I’m able to visit the majority of my friends’ homes. I have also rented a ramp when I needed a particularly long one to access a friend’s home that has five steps. Getting in and out wasn’t pleasant, but worth it to be able to enjoy more time with my friend. Lots of people travel during the holidays, and hotels fill up. Be sure to make a reservation as soon as possible to ensure that you get the accessible room you need. I always make my reservations by calling the hotel and asking them specifically to reserve the roll-in shower type of accessible room. That’s the only way to somewhat guarantee that you will get the right room, but mistakes can still happen. Do your research online and check reviews; some websites even show pictures of the rooms which may give you an idea of accessibility. If you have a service dog, don’t forget his or her needs during the holidays. Although service dogs are typically calm and well-trained, your dog may encounter things they are not familiar with, such as flashing Christmas lights, animatronic figures in store displays, or people playing musical instruments. Use patience and kindness to help your dog get used to these new experiences. When visiting relatives’ homes, it’s a good idea to keep your dog on a leash. Even if he or she is great at your home, they might have hazards around the house, such as a poisonous poinsettia or breakable items on low shelves. Even the most well behaved dog can be tempted by food on coffee tables or counters if not supervised. Your dog could slip out the door if there are lots of family members, especially kids, going in and out and not paying attention. Oh, and Aria says don’t forget to buy your pup a present! This is about more than just suitcase space. Remember that your presence is more important than the presents you bring. No matter what your budget, it really is the thought that counts. I try to buy things that are simple and meaningful. If you have a talent and can make handmade gifts, those who truly love you will appreciate them more than anything that could’ve been bought at the store. My grandfather made trivets from old picture frames and wine corks, and gifted so many of them to his relatives that we used to laugh about it. Now he’s gone, but we still use his trivets for all of our holiday meals. They are a precious memory of him. I’m a disability activist. I am strong in my advocacy, and in my everyday life I do my best to correct misinformation and point out ableism and stereotyping wherever I see it. However, at holiday gatherings, it’s best to choose your battles wisely. Sometimes it’s easiest just to keep the peace. If grandma wants to pray for you to be healed, or says “crippled”, nodding and changing the subject is probably the best choice. Like other prejudices, ableism is generational, and sometimes it’s not worth hurting well-meaning older people over less than politically correct language. However, it’s OK to draw the line somewhere, and you can decide where that is best for your family. If someone is making truly hateful remarks, you don’t have to sit there and take it. Everyone should be able to enjoy the holiday, and family members should all be aware of their behavior and show kindness and respect for each other. I choose to challenge ignorance and correct stereotypes primarily by example. If you talk about your life openly, your work, hobbies, and interests, you will show your loved ones that you live a normal life. Tell people about whatever you do that’s awesome and makes you happy. I often use travel to naturally change people’s perspective. It’s hard to feel sorry for someone, or doubt their abilities, when they road trip all over the country having adventures and writing about it. Travel and seeing family members can bring up old memories and conflicts. Remember that you’re not alone in this; nobody’s family is perfect. Chances are that your friends with and without disabilities are dealing with similar struggles. Don’t be afraid to talk to them about what you’re feeling; they will probably have stories of their own to share. If you can, make time to share the holidays with friends too. Friends are our chosen family and understand us in a way that our blood relatives sometimes can’t, no matter how much we love them. Wheelchair travel is lots of fun, but things never go perfectly. Scratch that. All travel is lots of fun, but things never go perfectly. If anyone tells you they had the perfect vacation, they’re lying. You just remember the good parts when it’s all over. When things are not so good, the best defense is to laugh. Don’t take it too seriously, don’t scramble. Breathe, relax, and take the time you need to solve whatever challenges come your way. Don’t try to hide or cover up your feelings and difficulties from your loved ones. I struggle with this one a lot, because I always want to be seen as capable. But we all fall down sometimes, and honesty is the best policy. I hope that this wheelchair travel guide will help you to survive the holidays with your sanity, mobility equipment, and sense of humor intact. Happy travels!